An MP3 File of the charity single that has been done for Stoke City's visit to Wembley. 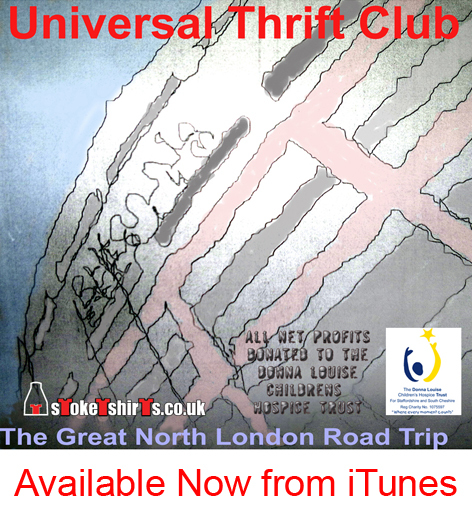 The Song is "The Great North London Road Trip" and is by "Universal Thrift Club"
An mp3 of the song will be sent via email upon reciept of payment. 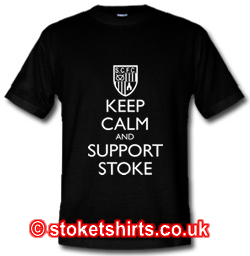 PLEASE ENSURE that an email is sent to utcmp3@stoketshirts.co.uk to inform us of your purchase. This email will be checked at regular intervals and the mp3 will be forwarded as soon as confirmation of payment is received. 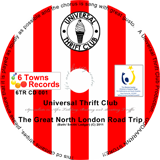 Universal Thrift Club have recorded a Wembley song to celebrate the Mighty Potters return to North London for a major semi final. It’s called “The Great North London Road Trip”. From the opening shout of “Come On You Rip Roaring Potters” thro’ it’s sing a long anthemic chorus of The Clash styled “oooo – o0oh – oo! – We’re off to Wem-ber-ley” to the mentions of “Sir Stanley Matthews watching from heaven” and “Sir Tony Pulis is shouting, he’s feeling T’riffic” it bombs along at 100 mph. Throw ins, Bread, RIP ROARING POTTERS and mentions of “white stockings” from our Nige make this a classic homage to Stoke City. Universal Thrift Club are formed from the remnants of “Big Cash Prizes” with Tom and Nathan being lifelong Stokies. Tom says The Great North London Road Trip is a homage to the current team who are creating history for our generation. We are currently setting up a recording studio for local bands in Longton so have been off the scene for a while.